Viewing topic "Oryginal User banks"
Anyone can share oryginal User1 User2 and User3 banks from Motif Rack ES in editor file format? A factory reset will restore User data. I therefore presume you have another reason for asking. What might that be? I want to load it into my Yamaha MODX. I don’t have Motif. The closest I have to what you’re asking for is a factory “ALL” file (W7A and W8A) for the ES keyboard, which has the USR1 and USR2 Voice banks. They’re the same as those in the Rack ES, but of course no USR3, and not in Editor format. Perhaps that will help. If not, hopefully another member will have the Rack ES factory data. Thank you again but only the Editor format can help me (because I do not have Motif). 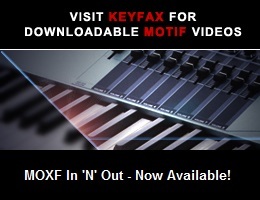 Yamaha MODX can load files from old Motif in the Editor format only. I care the most about Motif Rack ES with USR3 so I will be grateful for your help. Thank you again but only the Editor format can help me (because I do not have Motif). Yamaha MODX can load files from old Motif in the Editor format only.I care the most about Motif Rack ES with USR3. This is it. Thank you. Only missing USR1 and USR2 now in Editor format.I will be grateful if someone share it. This is it. Thank you. Only missing USR1 and USR2 now in Editor format.I will be grateful if someone share it. With the Editors for my XS and XF, I can open an “ALL” file (X0A or X3A) and then save an Editor file. If that can be done with the ES Editor, then the factory ES file I previously posted might be useful. Unfortunately ES Editor can read only w9e,w7e,w6e,w2e,m3e files. I tried to load your file but it does’t work. I loaded the ES “ALL” file to my XF, opened the XF Editor, and synced it to my XF. I then saved the XF Editor file, creating an X3E one, ZIP attached. Can you use that? Yes, I can use it. Thank you very much!